Check out student work at Research Across Disciplines Dec. 9-10. Members of the Webster University community are invited to visit the First Year Inquiry Showcase, which will display the results of inquiry projects conducted by students enrolled in First Year Seminars during the Fall 2016 semester. The showcase will feature posters, films and artifacts that reflect the research conducted by First Year Students. It is part of the Research Across Disciplines Conference held on the home campus in Webster Groves Dec. 9-10. During the conference, the First Year Inquiry Showcase will be open from 10 a.m.-3 p.m. on Friday, Nov. 9, and 8 a.m.-12 p.m. on Saturday, Nov. 10. Please come visit in room 261 in the East Academic Building. 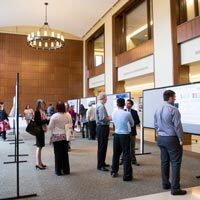 Research Across Disciplines (RAD) showcases undergraduate and graduate student work that makes an original intellectual or creative contribution to the discipline. The conference features students in a variety of academic and creative fields from across the St. Louis region and across the Webster network. Learn more about the entire Research Across Disciplines conference here. A full conference schedule and overview of sessions can be found here.